This is part two of a three part series on Mesut Ozil by Oscar Wood. Yesterday we took a detailed dive on Özil’s 2017/18 season. 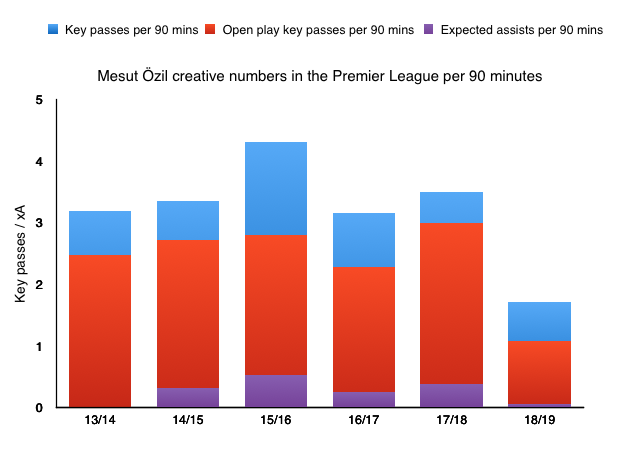 An interesting aspect of Mesut Özil is that while opinions of him are vulnerable to extreme fluctuations, his performance levels, and the statistical output he produces, are usually strikingly consistent. Such is the quality and repeatability of his core technical and mental attributes - ball control, passing, movement, decision making, vision - he rarely has an outright bad game, where he performs those aforementioned skills poorly (one rare example was actually the opening day against Manchester City, where his final third passing was a letdown). The most common reason for Özil having a mediocre game is usually external; when he’s put in a position where he can’t utilise his strengths and his weaknesses are exposed more. Usually this is when Arsenal struggle to get control of games and he simply doesn’t see as much of the ball as he’d like. In other words, it’s the age old cliche about how he can’t grab a game by the scruff of the neck, unless it’s there for the taking. This isn’t an issue for him over a sustained period of matches. Or at least, it hasn’t been so far in his career. Of course, like any player, he goes through physical ups and downs as well, meaning sometimes he has better months than others. But, whereas others like Aaron Ramsey and Henrikh Mkhitaryan may often have games where their touch and weight of pass is off, with Özil you usually know what you're going to get. Often his supposed up and down periods are simply down to the nature of assists. The finish is beyond your control and there’ll be periods where the other forwards run hot and periods where they run cold. All this makes his start to the season all the more alarming. The Arsenal fanbase and wider football world has had many moments of doubt surrounding the German before, but it’s rare that a period of Özil scepticism has been matched with a significant drop off in his statistical performance as well. Arsenal’s number 10 is currently underperforming in virtually every metric, with his creativity and overall passing numbers significantly worse than last season. Obviously you have to take the sample sizes into consideration, here, but the drop in numbers from Mesut this season are hugely concerning. While, as mentioned earlier, Özil’s statistics have tended to stay consistent over medium term periods, and we are still very early in the season, the fact Arsenal have a new coach has exasperated fears that Özil’s recent performances could be the start of a new long term trend. Arguably most striking is the drop off in overall involvement. While days can happen where a player fails to create moments of spark, a lack of involvement in possession indicates potential systemic issues. In the Premier League so far this season Özil has completed just 31.1 passes per 90 minutes, less than half of his career high figure in 17/18. To put things into perspective, in a typical game last season only Xhaka would play more passes. This season only Lacazette, Aubameyang and Cech are attempting fewer. So what factors could be behind Özil’s poor performances this season, and in particular, his lack of involvement compared to previous years? The most obvious change has been in his starting position. Emery has started Özil on the right in four of his five starts. Wenger, of course, almost always used Özil in a primarily central role, with only occasional spells on the wing, such as early in 14/15 and during the European run last season. From his number 10 position Özil had plenty of attacking freedom and regularly ventured to the wings anyway, but he also had responsibility to move towards the centre circle and offer himself in possession when both central midfielders were on the ball. 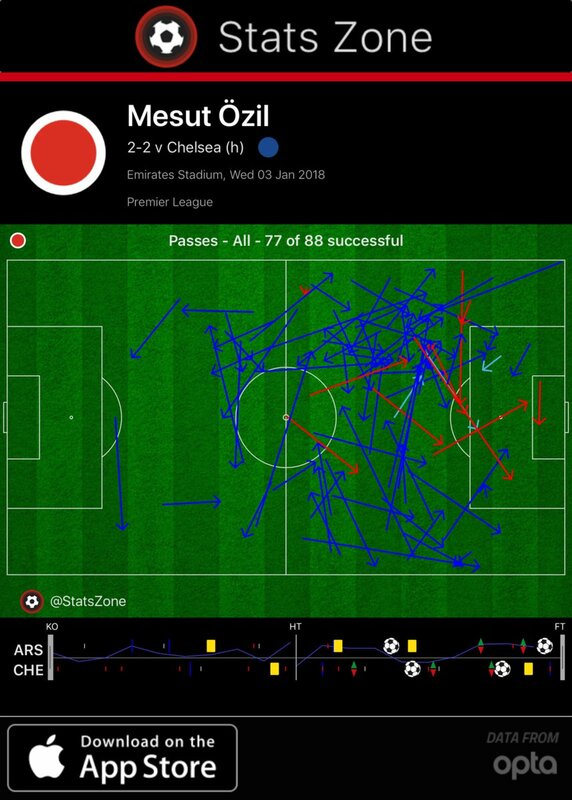 Just look at the areas and volume of his passing on Sunday compared to when Everton came to the Emirates in February. Özil arguably hasn't been helped by Arsenal’s left side bias in recent matches. In their last three games the Gunners have found progressing the ball up the left side of the pitch a lot easier than building through the right. One reason for this may be Granit Xhaka. Xhaka has usually been the dominant presence in possession, and as a left footer he’s more comfortable patrolling the left side of the pitch and circulating the ball to that side. It’s notable that despite nominally starting on the right, a lot of Özil’s involvement against Everton still came on the left wing. In fact, Xhaka’s preference for left sided passing, and Özil’s positioning on the right has significantly disrupted their on pitch relationship. While Xhaka didn’t have his best individual season last year, one thing he did do well was give the ball to Özil. Xhaka to Özil was regularly one of Arsenal’s most prolific pass combinations. The holding midfielder is usually Arsenal’s highest volume passer, and thus a lot of Arsenal’s attacks go through him. With so many of his passes going to Özil, it’s not a surprise the then number 11 followed him as Arsenal’s second most frequent passer in 17/18. This season that relationship has broken off. On Sunday only 7 of Xhaka’s 82 completed passes found Özil, just under 9%. In the same fixture last season, which Arsenal won 5-1, 17 of Xhaka’s 73 went to Özil, 23%. Equally important is the location of their combinations. On Sunday the few times Xhaka did find Özil was when Özil made rare venues to the left wing. There were only a couple in the central areas of the pitch, while in the fixture last season, the majority came in those spaces. Without that direct exchange with Xhaka, the ball has to go through different routes to get to Arsenal’s number ten, and it’s not a surprise he's seeing a lot less of the ball. It’s likely that a simple change of putting Özil back into the centre will not only prevent him from being isolated on one wing, but will also help Arsenal’s build up play and overall balance in possession. The central midfielders will have easier forward pass options, as Özil is more comfortable receiving in the number ten space than Ramsey is. If Aubameyang were to continue on the left, then getting Özil on the ball frequently in central areas could help him to operate as more of an outlet. The irony of Arsenal’s current left side bias is that while their best playmaker feels isolated on the right, their best outlet and poacher in the box is regularly involved in build up on the touchline, far from goal, and is often having to put crosses in for others when ideally he’d be the one getting on the end of moves. In these last few matches the rare times Özil has moved away from his position on the right have been some of the rare times Arsenal have looked potent going forward. His role in the build up to Aubameyang’s goal at Cardiff is an example. Against Chelsea and West Ham, Mkhitaryan was used on the right, with Özil central for one and absent for the other. Bellerin and Mkhitaryan enjoyed their partnership, and Arsenal did a lot more attacking down that wing in those two games. As @ThatGooner alluded to in his thread, Mkhitaryan likes to make runs behind into the channels, which creates space and allows a run for the right back to try and pick out. While Özil can make those kind of runs, it’s more of a change up option for him. He usually likes to come short and drift inside, and Bellerin hasn’t been able to build the same sort of partnership with him during build up, which has contributed to Arsenal's left side bias. Occasionally it'll be suggested that Özil’s form last autumn was down to him playing for a new contract, and that after securing a huge wage increase, he’s reached a comfort level that is hindering his motivation. That is a possibility. But it’s also a malicious accusation to throw at an elite athlete who has worked hard his whole life on improving his craft. His Europa League performances last season also show there's still hunger there beneath his usual solemn demeanour. Given his play style, Özil should still have more years to give to Arsenal at something close to peak level. If Arsenal are to play their best attacking football, if the Unai Emery era is to become a success, or if Arsenal simply want to avoid financial disaster, it’s imperative Emery finds a way to get more out of Arsenal's highest earner, and most gifted footballer. The most obvious reason that Özil has been shafted wide is because of Emery’s preference for using Ramsey as the number ten. In part three we’ll look at the difficulties of accommodating both Özil and Ramsey in the same team. Oscar is on Twitter @Reunewal. Follow him there. It has not been a good few months for Mesut Özil. His 2017/18 season finished disappointingly on a team level, with Arsenal’s elimination at the hands of Atletico Madrid in the Europea League. He then became part of a political storm in Germany when he and Ilkay Gündoğan posed for a photograph with Turkish president Erdoğan. What should’ve been a forgotten matter by the time of the World Cup reared back into focus after Germany’s earliest elimination in 72 years. The lack of support for Özil within the board and the negative press that surrounded the player, which regularly bordered on the extreme and had particularly sinister connotations in relation to the player’s national heritage, cumulated in one of the more shocking international retirements of recent memory. To make matters worse, the Arsenal man has had a particularly poor start to the season, just when supporters are hoping for an uptick in fortunes for the club. With all the negative attention that has surrounded the German in recent weeks and months, it has been easy to overlook something else. Something that might not be as obvious at the moment, but something that is just as important, if not more so, than anything else currently being said or written about the player. Mesut Özil is still Arsenal’s best player. At the moment, with him taking home a healthy £350,000 a week from the club, and his last top draw performance coming many months ago, people might scorn at the idea Arsenal’s new number ten is worthy of such a billing. But rewind eight or nine months and the narrative surrounding Özil was entirely different. With the negative energy of Arsenal fans predominantly focused on Alexis Sánchez it was easier to see the positive aspects of Özil’s play. The good will was only be helped by the building rumours of a new contract extension that cumulated with his renewal at the beginning of February. The road since has been more rocky. The burden that comes with such a wage hike started to bear heavy almost immediately, and the team overall have had few successes since their star man signed on. That can make it easy to forget just how important Özil is to Arsenal, and how good his performances were as recently as last season. Indeed, his 2017/18 season has become more underrated with time, thanks to recency bias and a combination of on pitch factors that meant he didn’t get quite the amount of recognition he could’ve done. In the Premier League he put in many of his best performances for the Gunners, was one of the Europa League's standout players in its latter stages, and was a consistent performer whenever he got on the field at the Emirates stadium. At face value, Özil’s eight Premier League assists represent a mediocre return for someone of his reputation as a creator. However, when it came to creating chances from open play, it was one of Özil’s best ever seasons. The 2.99 key passes per 90 minutes he played from non-set piece situations was the highest figure he’s had in a Premier League season, beating his previous best of 2.80 from 2015/16. One of the criticisms of the key pass stat (some call it chances created, they’re the same thing), and this isn’t without valid reason, is that it doesn’t take into account the quality of the chances created. Any pass that leads to a shot is one key pass, whether it’s a big chance, or a shot from 30 yards. But Özil’s expected assists per 90 figure was 0.38, which was the same figure as Kevin De Bruyne’s, who was widely cited as the league’s outstanding midfielder and creator last term. It was also higher than Özil's own figures in 14/15 and 16/17 figures (there’s no data for his 13/14 season) abut down on his astonishing 0.52 in 15/16. One thing which hurts his overall creative numbers is the fact he took fewer set pieces in 17/18. In 17/18 he averaged 3.2 corner takes and 0.9 free kick takes per 90 minutes. In 15/16 those figures were 4.3 and 1.3 respectively. His 16/17 figures were similar (they were slightly lower before that, Cazorla used to take quite a few). In other words he was taking one and a half fewer set pieces per match last season. Xhaka got three assists directly from corners last season, whereas in 16/17 he got none. Had Özil taken all the extra corners Xhaka took last season, his overall assist tally may have looked better. There isn’t open play only xA data publicly available unfortunately. But a significant reason why Özil’s xA per 90 in 15/16 (0.52) was better than his 17/18 figure (0.38) would’ve been those extra set pieces he took. Özil’s impact doesn’t just come with the final ball, however. Last season he actually increased his already significant responsibility in Arsenal’s possession play, particularly during the part of the season when the Gunners operated with a back three. That formation left Arsenal with fewer ball playing midfielders, and Özil became a key facilitator for Aaron Ramsey to make his trademark forward runs and support the attack. In the Premier League he completed a career high 65.05 passes per 90 minutes and was one of the league's best when it came to progressing the ball up the pitch. At his peak during the season from October to the end of January, he would regularly start a passing move, keep up with the play, then lay off the final pass to finish the play, like in the clip below against Palace. In the 2-2 draw against Chelsea, even Gary Neville was impressed by the way he took control of the match and dictated things for Arsenal. In that match he dominated possession in the final third. 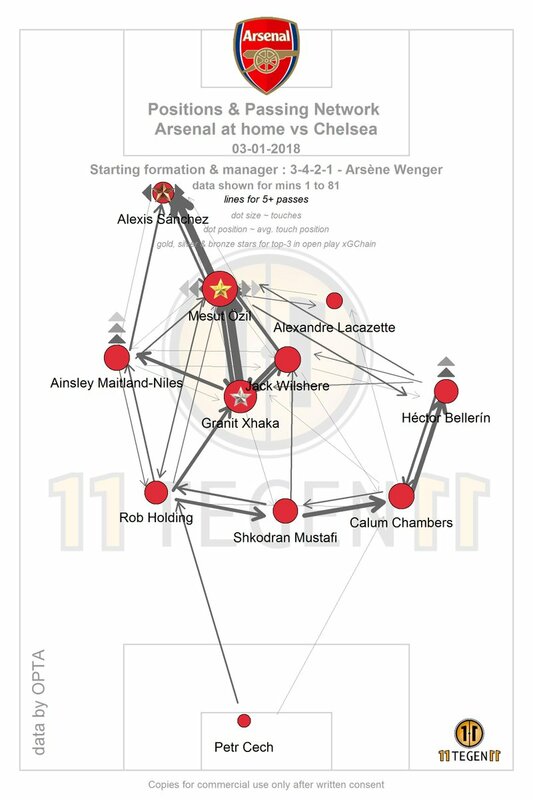 Özil was playing so many passes in dangerous areas of the pitch that he ended up playing 22 passes to Alexis, a remarkably high figure for a pass combinations between two forwards in a big game, which was bettered only by the 24 passes Xhaka played to Özil. What didn’t help Özil’s cause is the perception surrounding his absences from the team in 2018. A back injury ended his club season after Arsenal’s Europa League tie with Atletico Madrid and seemed to disrupt his World Cup. Özil isn’t the only player to miss games through injury and illness, but with him there is definitely an impression that, at best, he misses games too easily, and, at worst, has excuses for him entirely fabricated so he can enjoy extra time off. When he misses games there are more tinfoil hat appearances on the Twittersphere than there are for perhaps any other player. We have to ask ourselves whether such attitudes to his absences are really fair. After missing the West Ham game Unai Emery became the third manager in recent years to excuse Özil from a game because of illness. What is more likely; three different managers deciding to give him special treatment, or him simply having a below average immune system? On face value Özil missed 12 league games, which isn’t great. However the majority of these came from February onwards, when Arsenal’s priorities shifted from domestic competition to their European run. He played every Europa League knockout game bar the Östersunds home tie, and was a standout player in the competition (only in the Atletico away match did he fail to put in a high quality performance). In other words, there were essentially just five games Özil missed that were important to Arsenal’s season. 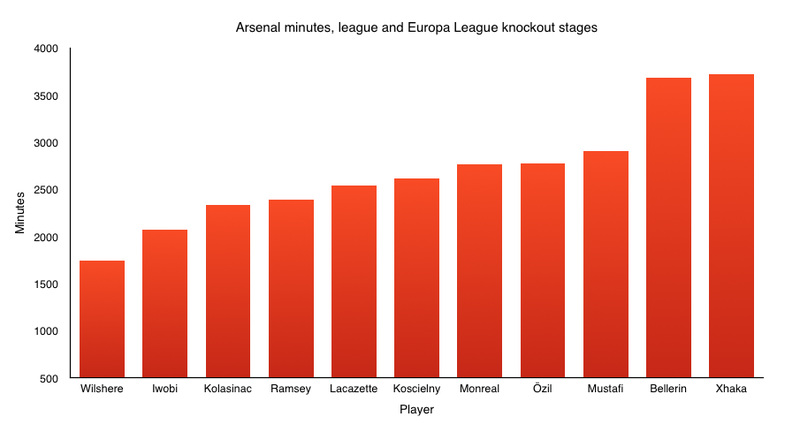 In the Premier League and Europa league knockout stage, the important fixtures in Arsenal's season, Özil played the fourth most minutes for Arsenal, more than the likes of Lacazette, Monreal, Ramsey and Koscielny. Missing sporadic games here and there also looks bad because of the number of different no shows, but when almost all the absences are short the collective damage is minor. Missing three one off games through illness is certainly no worse than missing five weeks with a muscle strain. Of course, not even Özil’s biggest detractors will argue he’s incapable of doing useful things on a football pitch. The debate has always been about whether the trade offs of giving such a narrowly defined player great responsibility are worth it. Do you gain more than you lose? Özil is best used centrally rather than wide, but he can neither defend like a true midfielder, nor score like a true second striker. These traits make him something that is surprisingly common in the Arsenal squad; a player with a few elite skills who needs a fairly confined role in order to prosper to his full capabilities (I think Aubameyang and Ramsey fall into this category as well, somewhat). 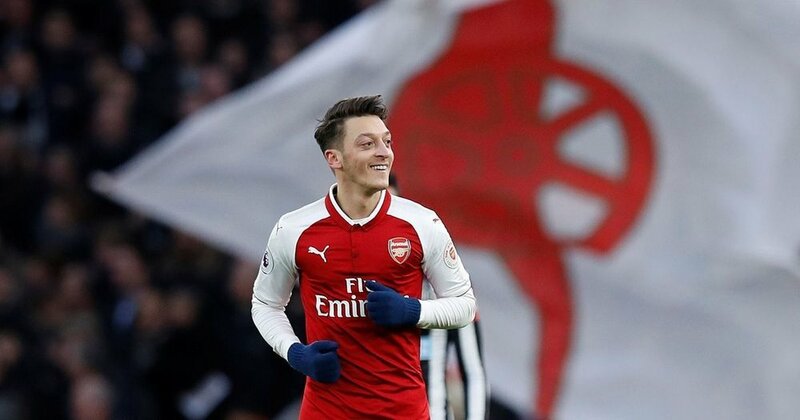 it would be a shame if Özil’s best performances were to become purely a thing of the past under Unai Emery. 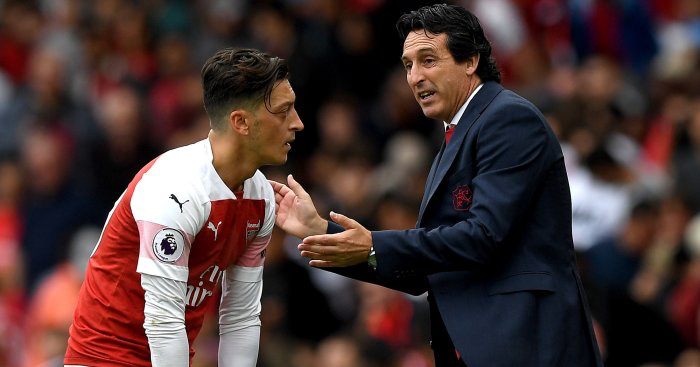 Tomorrow we’ll take a look at the beginnings of Özil’s 2018/19 season, and why the German has so far struggled under Unai Emery.